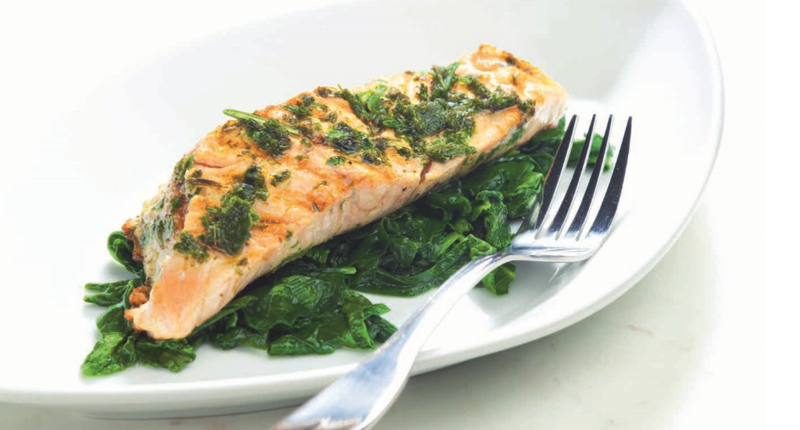 Holland America Line prides itself on serving sustainable seafood, and while cruising in Alaskan waters there’s no more iconic dish than grilled salmon. – 6 oz or 170g each Chef’s Promise (or other) fish rub as desired 1 minced garlic clove 3 bunches watercress, stems trimmed, washed -Combine first 5 ingredients in food processor. Blend until nuts are finely chopped. Add 6 tablespoons oil and process until well blended. Season with salt and pepper. -Brush salmon with oil and sprinkle with salt and pepper to taste. Grill salmon on an oiled rack until just cooked through, about 5 minutes on each side. -Meanwhile, in a large heavy skillet sauté the garlic in the olive oil over moderately high heat for 30 seconds, or until it is fragrant. -Add the watercress, and stir the mixture until it is combined well. -Sauté the watercress, covered, for 2 to 3 minutes, or until it is just wilted, and season it with salt and pepper. -Place sautéed watercress in the center of plate. Top with the salmon and spoon pesto around. Serve with basmati rice. Garnish with garlic cherry tomatoes and lemon wedge.